The project site is located on approximately 24 acres in the community of Isla Vista in Santa Barbara County. The property is within the Devereux Slough watershed. 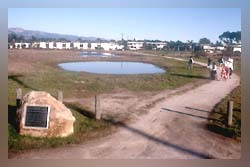 The Del Sol Vernal Pool Reserve, owned by the Isla Vista Recreation and Park District, is directly to the east. The property is heavily used by pedestrians accessing Isla Vista School, university housing, the University Childcare Center, West Campus stables, the Coal Oil Point Reserve, and the surrounding residential area. It is connected to the coastal bluff by publicly-owned open space and easements. The community of Isla Vista has been extensively altered over the past century. Once inhabited by the Chumash people and early California settlers, the Isla Vista area boasted open stretches of coastal plain dotted with many large vernal pools (Olsen, 1992 "Decades of Farming Lima Beans & Barley"). A military base was built in 1942 at the future location of UCSB, marking the beginning of major urbanization in the Isla Vista area. After the military abandoned the area in 1945 and it became the present-day campus of UCSB. In the early 1950's, urbanization increased at a rapid pace. During the 1960's, many large apartment complexes were constructed to house the increasing student population. Most vernal pools in the area were destroyed and those remaining were subjected to mosquito abatement activities, including spraying with insecticide, draining and filling (Ferren and Pritchett, 1988). Although the Camino Corto site was cultivated, graded and devegetated in the past, it still contained remnants of the once expansive vernal pool habitat. In 1988 Santa Barbara County Public Works Department received a Coastal Resource Enhancement Fund (CREF) Grant for the purchase of the Camino Corto property. The Coastal Resource Enhancement Program requires offshore oil and gas projects that have resulted in significant and unavoidable impacts to coastal resources to contribute to a fund. One of the major reasons for the requirement of the fund is to compensate for impacts to sensitive coastal resources and recreational opportunities such as those found on this site. Subsequent CREF grants were received by Santa Barbara County Planning & Development to fund preparation of a Master Plan and to complete other site improvements which included the creation of a neighborhood park and footpath improvements. 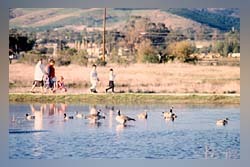 In 1997, Planning & Development received a CREF grant to restore and create vernal pool wetlands, restore native grassland and the riparian corridor, install interpretive signs, install perimeter barrier posts, provide educational materials for environmental curriculum and conduct plant community monitoring and data analysis.